Ever stuck wandering through the makeup aisles in Sephora, with little idea of what goes well with your outfit? Well L'Oreal Paris has come up with a solution for any occasion. This fun new app allows you to take a snapshot of your clothes and find the right shades of makeup to match, blend, or clash with your fashion number. It even asks whether your outfit is for nighttime or daytime. The 'Color Genius' will come up with a selection of lipsticks, eye-shadows, and nail polishes that are suggested to work well with your outfit. 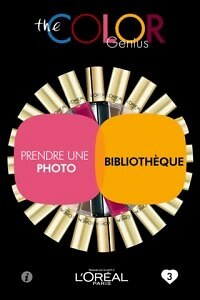 The app will give you the L'Oreal products names and description which go with the look you want. L'Oreal Paris introduced this app in time for the Cannes Festival this year, so that guests could use the 'Color Genius' app to find makeup to match their glamorous gowns. They even had their global spokesperson, Madame Ines de la Fressange do an exclusive video to demonstrate the app's usefulness. Go HERE to download the free app and start finding the right types of makeup to compliment your every day fashion trends!